Winner of an Emmy and numerous other awards, this riveting tale of ambition, debauchery, and intrigue remains one of the most popular and acclaimed dramas in Masterpiece Theatre history. The celebrated BBC series spans the history of the Roman Empire from Augustus through Claudius, a stuttering scholar who learns early to play the fool and stay alive. The DVD 5-disc set includes the complete 12 episodes, along with a bonus disc, featuring two feature-length documentaries, extended original versions of the first episodes, a new Derek Jacobi interview; SDH subtitles, and much more. 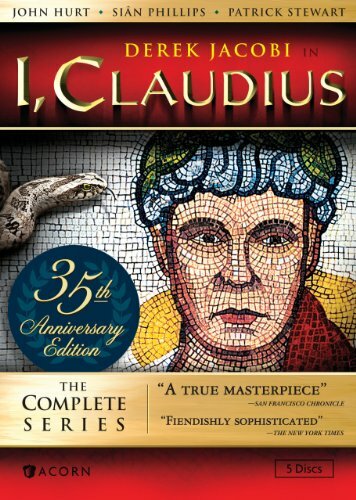 Silver Spring, MD -- The star-studded BBC epic, I, Claudius , arrives to DVD from Acorn Media on March 27, 2012 packed with bonus features. Winner of an Emmy(R) and numerous other awards, this riveting tale of ambition, debauchery, and intrigue remains one of the most popular and acclaimed dramas in Masterpiece Theatre history. The celebrated BBC series spans the history of the Roman Empire from Augustus through Claudius, a stuttering scholar who learns early to play the fool and stay alive. The DVD 5-disc set includes the complete 12 episodes, along with a bonus disc, featuring two feature-length documentaries, extended original versions of the first episodes, a new Derek Jacobi interview; SDH subtitles, and much more ($59.99, www.AcornOnline.com). Based on the novels by Robert Graves, it stars Derek Jacobi (The King's Speech, Cadfael) as Claudius in a career-defining role. Sian Phillips (The Age of Innocence) is "exquisitely wicked" (Los Angeles Times) as the lethal Livia, wife to Augustus (Brian Blessed, Hamlet), while John Hurt (The Elephant Man) is "decadence personified" (USA Today) as the depraved Caligula, whose reign of terror paves the way for Claudius's ascension. Patrick Stewart (X-Men), George Baker (The Ruth Rendell Mysteries), Margaret Tyzack (Cousin Bette), and James Faulkner (The Bank Job) also star.